When the United States formally entered World War II in December, 1941, campus life abruptly changed to support the war effort. The academic year was altered to permit additional short terms just after Christmas and over the summer, so that students who might be drafted could graduate in just under three years. Special courses were added to train military personnel, and research became almost exclusively war-related. A Naval ROTC unit was headquartered in the Littlefield Home, with two anti-aircraft guns placed on the front lawn of the Victorian mansion, and a practice firing range in the attic. By 1943, ROTC had been absorbed into the Navy’s V-12 program, which brought thousands of officer candidates to the campus. Despite the seriousness of the times, students still found ways to have fun, and much of the University’s social life centered on the Texas Union. During the war, the Union was a place to both participate in the war and escape from it. The U.S. armed forces opened a recruitment center in the building. Classes in first aid, bandage rolling, and how to be an air-raid warden were common. The Union was also the drop-off site for an endless series of collection drives. Aluminum, rubber, and books and magazines for soldiers overseas were the most successful. 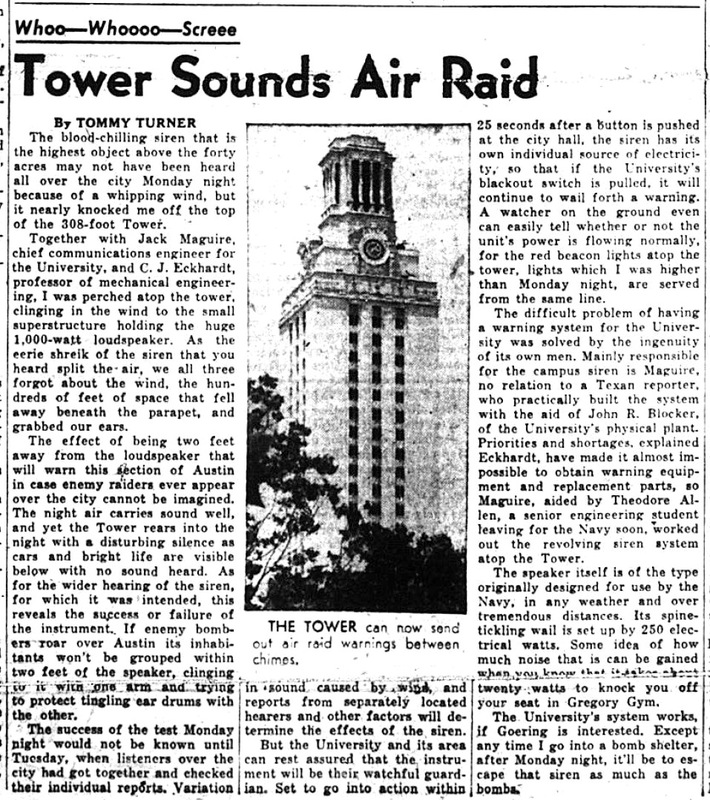 An air raid siren was installed on top of the UT Tower, while instructional classes on how to be an air raid warden were held in the Texas Union. The article is from a November 1942 issue of The Daily Texan. Click on the image for a larger view. In the fall of 1942, the War Effort Council, a committee that coordinated student war activities, looked for a way to solve an issue caused by the war. 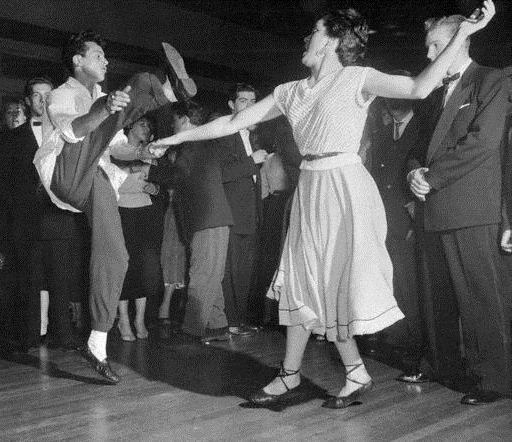 The all-University dances, held every weekend in the Union Ballroom, were extraordinarily popular through the 1930s. Jazz greats such as Benny Goodman and Duke Ellington brought their bands to the campus, and revenue from the dances allowed the Union to remain self-supporting. With the onset of war came gas rationing and tire shortages. Dance bands could no longer easily tour the country; University students had to rely on local talent or supply their own. 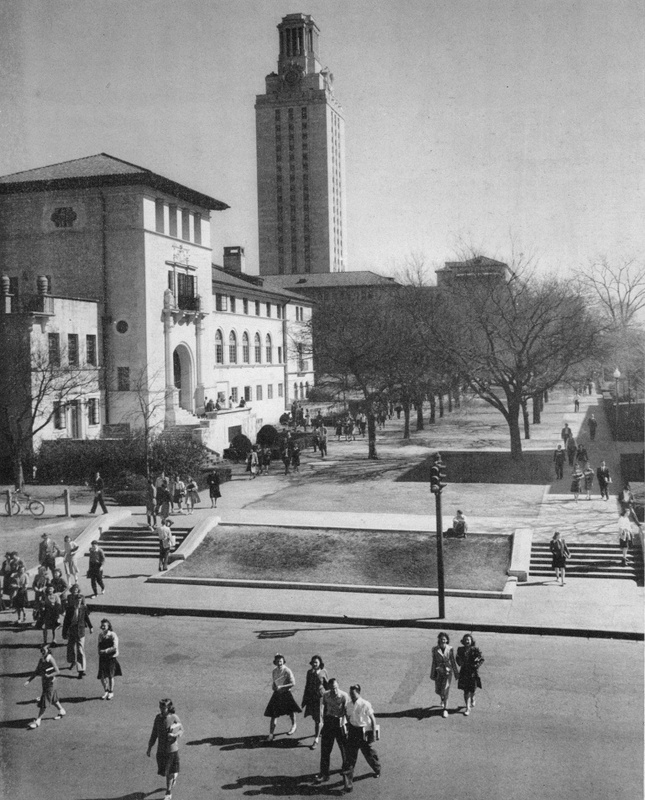 The “Longhorn Room” debuted Saturday evening, November 14, 1942, to a sold out crowd of 600 persons, including UT President Homer Rainey and his wife. Decked out with wagon wheels, cedar posts, bales of hay and red-checkered tablecloths, the Union’s ballroom was transformed into a western-styled nightclub. Couples (no stags allowed!) were charged fifty cents, and could reserve tables in advance. Music was supplied by the Union’s record player. “Music for dancing will be furnished by 120 records and patrons are asked to make requests for their favorite tunes,” announced the Texan. Student groups, including the Texas Cowboys, Alpha Phi Omega, Orange Jackets, and Silver Spurs, volunteered to set-up and decorate, wait on tables, tend bar, and clean up afterward. The highlight of the evening was the half-hour variety show, which was often unpredictable. A sorority might perform a short musical, complete with costumes and dancing, or individual students would entertain the crowd with stand-up comedy. Occasionally the football team brought down the house with their version of the Can-can. This entry was posted in Uncategorized and tagged Jim Nicar, Longhorn Room, Texas, Union, World War II by jimnicar. Bookmark the permalink. Coach Mueller – Yes, it does. And the Orange Julius drink was created in 1929 in Los Angeles. The newspaper articles, though, make it sound as if Kickapoo Joy Juice recipe was something new to Austin. It’s a good question.